When Kudumbashree members were requested to donate their one week’s saving – a humble Rs 10 – they went on to do beyond what was asked. The weekly saving of a member of Kerala’s self-help group under the Kudumbashree unit is a humble Rs 10. But when the 43 lakh members of the State Kudumbashree Mission, a model of women empowerment of Kerala, decided to come together to donate as much as they could to the Chief Minister’s Distress Relief Fund, the amount was a whopping Rs 7 crore. The fact that these women donated this significant amount becomes even more important when you take account that many of the donors suffered losses in the deluge too. It all started with an appeal by Kudumbashree Mission Executive Director S Harikishore. He asked the members to give their one week’s savings, and received an overwhelming response. “If we calculate Rs 10 from 43 lakh members it would come around Rs 4.3 crore. But the members surprised me by going beyond what was asked. Some Kudumbashree groups even donated what they had set aside for Onam celebrations,” Harikishore told TNM. Even the training group and audit groups of Kudumbashree came forward with contributions. “I had made it clear that this is not mandatory and no one could force them. 60% of the Kudumbashree members themselves are affected by the floods… I think that’s what made them realise the impact, and their response was to contribute to rebuild the state,” he added. The self-help groups also went around in their areas, collecting donations from the locals and contributed the entire amount to the Kerala CM’s Relief Fund. As the water recedes, the next challenge before the state is to rid the houses and buildings of flood water and make them liveable and functional again. Here too, Kudumbashree members have been actively involved. They hope to clean more than one lakh houses and more than 2000 public places in a drive which Kudumbashree volunteers from various districts of the state. 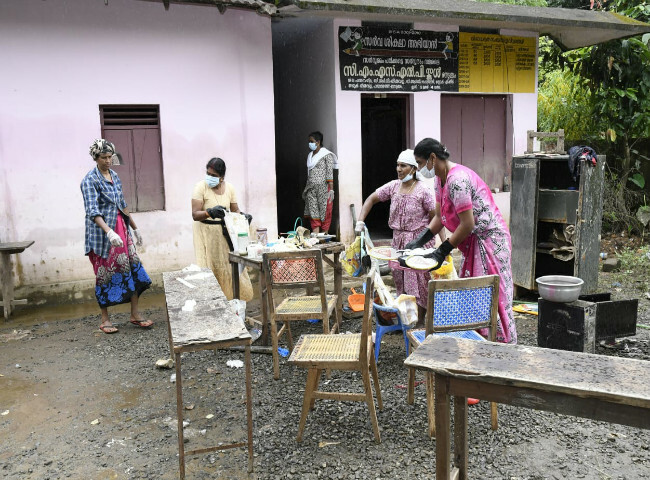 On Friday for instance, a team of 57 women from Kundumbashree in Mailam panchayat in Kollam came to Pathanamthitta district to take part in a cleaning drive. 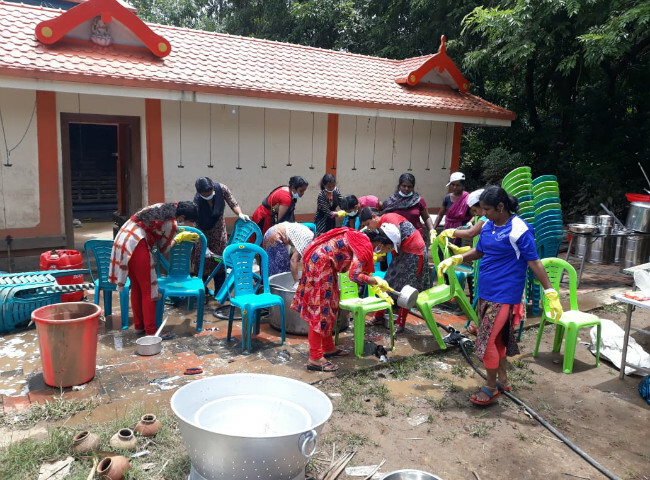 “Something good would come out of all these that is what I feel,” said Sheeja Beegum, a member of a Kudumbashree unit of Pathanamthitta, as she washed utensils at a flood-affected house in Aranmula. She was with six members of her Kudumbashree unit. “Tomorrow we are planning to go to Malakkara. We feel really sad when we see all this. Our aim is to make the houses liveable so that families can rebuild their lives in their homes,” she added. Sheeja and team have also collected materials for relief camps; especially sanitary napkins, and undergarments for women. They have also been enquiring about scarcities in relief camps across Pathanamthitta and arranging food packets for several days. In Ernakulam meanwhile, Kala Raju, Kudumbashree Community Development Society chairperson of Koothattukulam, has been engaged in cleaning the more isolated homes in Kunnukara, that is on the shore of river Periyar in the district. “The first day, about 20 of us came in a tempo traveler; second day 33 of us came. The area was still isolated… Once, our vehicle got stuck in the mud and some of us even fell in the slush. But, somehow, we managed to reach,” Kala narrates. “But we are content, because we fulfilled our purpose of coming here: we could make the houses livable,” she adds. Kala and team even carried clothes worth Rs 7,000 to give to the families. “They had lost everything, so we kept the clothes with us to give them,” she says. Apart from volunteering, the cleaning drive and collecting and supplying materials for relief camps, Kudumbashree members are also providing counseling for 8,000 flood hit people. According to a recent media statement, Kudumbahsree members had also housed nearly thousands of people in their homes during the deluge. This article has been produced in partnership with Oxfam India. In the last 10 years, Oxfam India has delivered over 36 impactful humanitarian responses in India.Oxfam India is providing critical relief to the affected families and communities in Kerala: clean drinking water, sanitation, and shelter kits. Click here to help #RebuildKerala.